(Photo: Peter Kenny)Area around St. Peter's Basilica on June 4, 2008. A thief who purportedly stole two important documents authored by the great artist Michelangelo has asked for cash in exchange for the historical artifacts, a Holy See spokesman has said. Vatican spokesman Father Federico Lombardi confirmed March 9 for the first time since the loss of the papers in 1997 that a ransom demand had been made to a top church official, Cardinal Angelo Comastri, the vicar general for the Vatican City State. "Naturally, as we are talking about stolen documents, the cardinal refused," said Lombardi, reported the Agence France-Presse news service. Lombardi did not elaborate on how the theft took place, or why the incident had never been made public since its reported disappearance in 1997. He recalled that a nun who had worked in the Vatican archives reported the documents had gone missing. 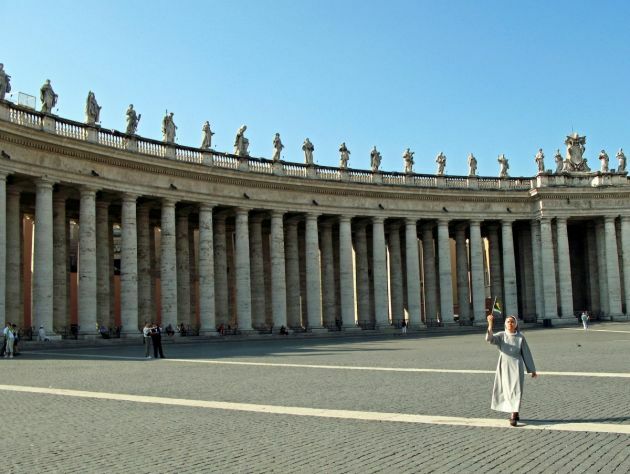 The Rome newspaper Il Messaggero said the person who claimed to have possession of the missing documents was "a former Vatican employee." The person had asked for €100,000 ransom, the report by Il Messaggero said. The Rome newspaper said the person had the letter that is signed by the acclaimed Renaissance painter. But Lombardi said two items had been lost, which included a document believed to have been written by him. Vatican police are working closely with their Italian counterparts in investigating ransom demand, according to the spokesman. The documents are part of a huge archive linked to the construction of St. Peter's Basilica. Michelangelo, an architect and engineer aside from being a sculptor and painter, had been brought in to oversee the construction in 1547 after years of sluggish pace. He is considered to be one of the principal architects of the basilica, which still stands today and is a key symbol of Roman Catholicism.